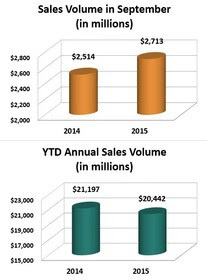 The market posted strong numbers in September, keeping pace for a strong finish to the year. Even though a bit more inventory has come to market in the past two months, we’re still seeing low inventory as levels remain well below the 6 month benchmark signaling a balanced market. This month we’ll look at the underlying demographic trends contributing to the shortage of listings, but first the market data. The volume of real estate sold across all Front Range increased 7.9% on a year-over-year basis in September, and decreased 9.9% on a month-over-month basis with the normal seasonal slowing. The inventory of homes for sale increased by one tenth of a point to 2.0 months. The lack of homes for sale, particularly at the lower price segments popular with first-time buyers, has been the headline story of the market for years now. A lack of supply is driving up prices and keeping many buyers from getting across the finish line to closing. So why aren’t we seeing a natural market reaction of more homeowners listing their homes for sale? A study by the Harvard Joint Center for Housing sheds some light on that question. Researchers found that homeowners aged 35-44 historically make up the majority of trade-up buyers. However, fewer homeowners in this key age group has meant fewer potential trade-up buyers and sellers, meaning fewer people putting their homes on the market, adding to tight inventories of homes for sale. Specifically, among the 35-39 year old age group the number of homeowner households dropped 23 percent between 2003 and 2013, and among 40-44 year-olds the decline was a substantial 19 percent (see figure below). In short, from a basic demographic perspective, there are fewer Gen Xers (once called the Baby Busters) than there are Baby Boomers, and fewer of these Gen Xers own homes they can put on the market. So what is going to solve the inventory shortage? Baby Boomers to the rescue yet again. The Harvard study hypothesizes that aging Baby Boomers will sell off their homes as they downsize or move to non-ownership situations. Of course, the oldest Boomers are still only in their late 60s, meaning most are many years from exiting the housing scene. While we wait for the Boomers to sell, trends we’re seeing in the short term that address the inventory challenge include more buyers looking to new construction, infill and remodeled homes for supply. Also, many homeowners who bought after the market correction and have only owned their property for two or three years already have significant positive equity due to rising prices. These homeowners are already selling and trading up to their second home. Overall, more than 6 million homeowners have moved from negative equity to positive equity in the last 3 years according to Core Logic. As these homeowners realize they can take those gains, many will consider selling. Regardless of your demographic, here at 8z we’re always happy to help you navigate the ever-changing real estate landscape.